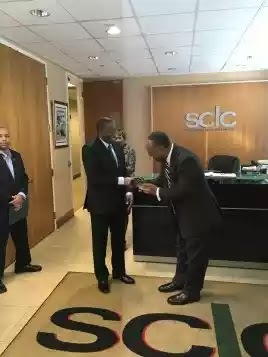 Former President Goodluck Jonathan, Thursday received the Southern Christian Leadership Conference (SCLC) Presidential Award in Atlanta, Georgia. He got the award in recognition of his leadership in advancing human rights, social justice and the fight for universal freedom. The SCLC, founded by the late American Civil Right leader, Dr. Martin Luther King Jr, in January 1957, is currently led by Dr. Charles Steele Jr.
Jonathan met privately with the Steele, who proposed to work with him to advance the cause of peace around the world and to bridge the gap between people in the Diaspora and Africa.